In a few week’s time we’ll be hosting SteamCon UK in Manchester, and we couldn’t be more excited! It’s going to be a weekend to meet new people from the awesome community and reunite with old friends once more, make some incredible memories, and of course, play some great games! You haven’t bought a ticket yet? There are only a few left! Buy your ticket for SteamCon UK HERE and join us for a weekend-long celebration of all things Steamforged Games! 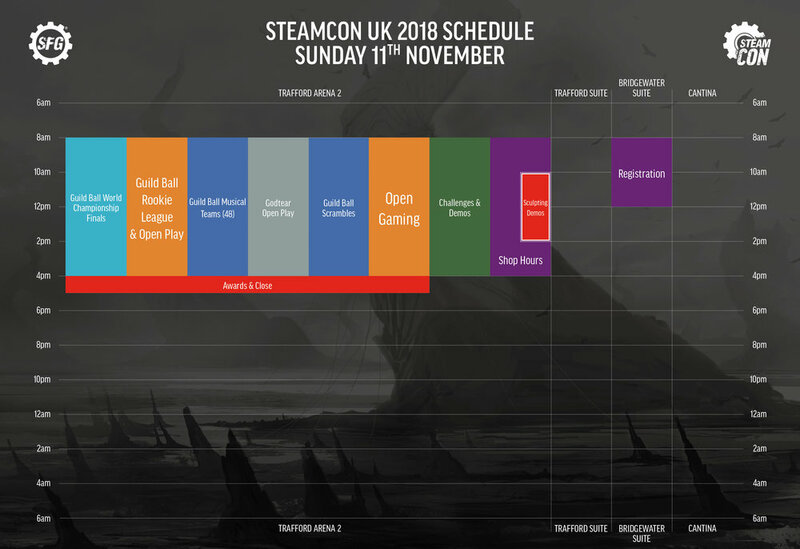 Most of you will have seen the earlier version of this, but for those who haven’t, the SteamCon schedule is designed to let you customise your weekend exactly as you choose. If you want to play competitive Guild Ball all weekend? We have the World Championship Last Chance Qualifier (LCQ) on Friday and Saturday as well as smaller ‘scramble’ events running all weekend. For those new to SteamCon, a scramble event is any collection of 8 players looking to play a mini tournament – just ask the staff at our head desk to record the results and away you go! Alternatively, if you just want to celebrate the arrival of Guild Ball Season 4 in a more laid-back environment, we’ll have casual gaming space all weekend long. If you’re lucky you might even be able to catch a game with one of the Steamforged Games staff! Don’t forget to record your games for the Free Cities Draft, SteamCon UK is your last chance to submit results for your Guild! Have you been enjoying the Free Cities Draft? Want to know some of the behind the scenes details about how the campaign came about, and get to know each of the rookies a little better? How about some super secret insider information for the last weekend of the campaign? Well, there’s a seminar just for you. Join Guild Ball Lead Writer Sherwin Matthews for a relaxed seminar about the latest narrative campaign, where he'll be more than happy to answer your questions and help you decide where your Steamcon votes are going. Would you like to know more generally about the world of Guild Ball? Sherwin will also be running the ‘Guild Insider’ seminar. In this seminar we'll be discussing some of the themes of the upcoming Season 4 lore and how it ties into the story so far, as well as the narrative decisions and challenges which went into creating other Guild Ball literature such as Theron Origins, Union in Chains, and the Free Cities Draft. Following this we'll also have time for a question and answer session where you can ask your questions about the Guild Ball backstory. Godtear Lead Developer Steve Margetson will be floating around our Godtear open play tables for most of the weekend, available for games and to answer any questions you have about Godtear. Whether you’re looking for a demo of Godtear or if you’ve been keeping up with Early Access, this will be the perfect time to meet and play other fans of the game. We’ll also be bringing with us a whole load of full art standees to play with so that you can play Godtear with EVERY champion that has Early Access rules! Perhaps painting or modelling is more your thing? Enter your models into the SteamCon UK Master Artisan Competition! Here at Steamforged Games, we have a huge appreciation for the incredible effort and skill that our players regularly put into making their miniatures look as magnificent as possible. Enter your models over the course of the weekend, judging will take place on Saturday afternoon, and at midday on Sunday we’ll crown our 2017 Master Artisans! Only Guild Ball, Godtear, and Dark Souls™: The Board Game miniatures are eligible for entry. Conversions are allowed. If you wish to enter converted models, then the majority of each model must consist of parts from the original Steamforged Games Ltd miniature. Miniatures are only eligible to be entered if the owner modelled & painted all of the miniatures themselves. Group Category – a team of 6-8 Guild Ball miniatures, a Godtear Champion and their followers, or a party of 4 Player Character miniatures from Dark Souls™: The Board Game. Open Category – Dioramas allowed. Alternatively, visit the Steamforged store where you can pick up the latest releases. A new Season is a fantastic time to try a new Guild for the first time. Do the Farmer’s Guild catch your eye? What about the Blacksmiths? Maybe it’s the devious Ratcatchers or the cunning Falconers. Any of the PVC pre-built boxed sets are perfect for opening and playing with straight away. Additionally, SFG Sculptor Tom Lishman will be running one to one sessions where he’ll walk you through digitally sculpting your own piece of Guild Ball or Godtear. Need to escape the hustle and bustle of the convention for a little while? Take a trip upstairs to the onsite Cantina Space Bar! Speaking of which, the Cantina is where we’ll be running the social SteamCon Mixer, a nice and relaxed way to cool off after a hard day of convention activities. Plus, there’s usually some extra goodies just for turning up! Continuing right into Saturday, the top 8 players from day one of the Guild Ball LCQ will be duking it out to see who gets to take the last spot at the Guild Ball World Finals on Sunday. We’ll also be running a qualifier for the Guild Ball 2019 British Championship for anyone else looking to play a competitive event, as well as even more scramble events and casual play. Back to the seminar room where Sherwin will be repeating two of Friday’s seminars for anyone that missed out, Guild Insider and The Entertainer’s Guild. Before those however, we have an extra special session featuring SFG’s Chief Creative Officer Mat Hart, and Lead Writer Sherwin Matthews. The fan favourite ‘Design a Model’ seminar is reappearing in an even bigger and better format! This time you’ll be helping Mat and Sherwin design a model for the Brewer’s Minor Guild, the Entertainers! The SteamCon US session created Kid Blackhearrrt, now it’s your turn to dig up some gold! To cap off the end of a huge day, join the SFG Development Team for the SteamCon UK Keynote! We’ll be talking about some of the things Steamforged Games has planned for the future as well as revealing the results of the Free Cities Draft, followed by a question & answer session. After the rush of Friday and Saturday, Sunday is a little more relaxed but still packed with loads to do! We’ll be running even more Guild Ball scramble events and open play, as well as Godtear open play. Our challenge tables and the Steamforged store will still be open and available. Finally, we will round off the weekend with a small closing ceremony. That’s all folks, we hope you’re as excited as we are about SteamCon UK! We’ll see all you lucky attendees in a couple of weeks, and if you still don’t have a ticket, there are still a few available here!